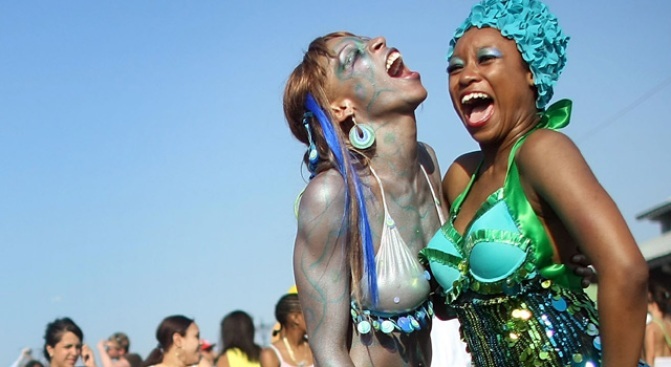 Get clamorous at the Coney Island Mermaid Parade on Saturday. TAILS OF THE CITY: Admittedly, you could move to Nebraska or Iowa, where you’d have a yard and a car and cocktails would be $3. But let’s face it: You put up with New York City because of wonderful stuff like the 26th Annual Coney Island Mermaid Parade. The annual nautically-themed bacchanal runs along Coney Island’s Surf Avenue; bring sunscreen and follow the crowds. Saturday, starts at 2PM. EATING GREENE: The second annual Summerfest in Fort Greene will have all the usual block-party markers – music, kids’ activities, and so on – but we’ll be going for the Taste of Fort Greene/Clinton Hill. Sample goods from some of the neighborhoods’ most delish restaurants and food purveyors, like Brooklyn Ice Cream Factory, Steve's Authentic Key Lime Pies, Chez Lola & Chez Oskar, and more. Urban Assembly Academy of Arts & Letters, Saturday,12-3PM. SURF’S UP(TOWN): If it doesn’t look like you’re going to get to the beach in Tel Aviv anytime soon, no worries; this Sunday, it comes to you. Central Park turns into a bona fide Israeli beach, complete with lifeguards, umbrellas and beach chairs, plus games (Israeli paddle ball!) and popsicles, live music from a handful of Israeli pop bands, and – of course – free sunscreen. Naumberg Bandshell, Sunday, 11AM-6PM. TWO-WHEELER: Our favorite part of the New York Bicycle Film Festival is the Bicycle Parade; in turn, our favorite part of the Bicycle Parade is the Bicycle Beauty Pageant. Dress up your ‘cycle (anything goes, the more outrageous the better) for a chance to win prizes – or at least, the crowd’s awe and admiration. 2nd Street/2nd Avenue, Saturday, 1PM. VIVE LA MUSIQUE: Sunday’s Make Music Festival, which’ll have hundreds of live performances going on all over the city (and in cities all over the world) was born out of Paris’ own Fete de la Musique. So may we suggest heading to the Central Park SummerStage for an afternoon of French pop music (it’s not all crap, people) headlined by ex-tennis champ-turned-recording artist Yannick Noah? Coralie Clément and Mayra Andrade also perform. Oui. Sunday, 3-7PM.